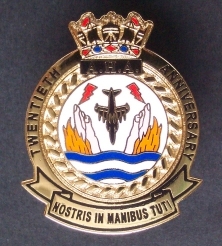 Aircraft Handlers Association - Twentieth Anniversary Badge. The Aircraft Handlers Association (A.H.A.) was formed 20 years ago and now has over 1000 members. Their members are all current or ex-serving Royal Navy, Fleet Air Arm ratings. The Aircraft Handlers are responsible for the safe movement of aircraft both ashore and afloat. They also have the task of operating the Airfield crash rescue fire fighting services. In the past there role also extended to operating the Royal Navy's Air Traffic control centres. Badge Type: High quality hard enamel complete with tie pin fastening attachment; Size: 30 mm tall; Colour: Red, Black, Blue, Gold, White, Pink & Orange. Reverse Side: Blank apart from makers mark.